Halloween movies can be scary to watch, but would they be as scary without some great music to set the mood? Earlier in our 31 Days of Halloween series, Michael Noble had a look and a listen to some off-beat music for the Halloween season. The first time I heard the theme to The Blob, I thought someone at the TV station screwed up the audio! It certainly misleads you for what is to come. But I like my Halloween music to be really scary. Every year, I’d set up my speaker and my CD player on the front porch and enjoy the soundtrack that went with the visual of all the people dressed in costumes, walking up and down the street. These are a few of the horror movie themes that set the tone — for me — for Halloween. Now turn down the lights and have a listen. The Omen — Seriously, what can be more frightening and disturbing than a choir chanting in Latin about Satan? That choir and Jerry Goldsmith’s lush orchestration and the end with just the choir chanting makes the hair on the back of my neck stand on end. 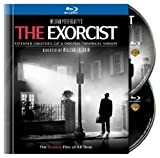 The Exorcist — Undoubtedly one of the most iconic horror movie themes ever. It’s a little poppy, a little jazzy, but there’s still an ominous undertone to it, especially when you know what you’re about to see unfold on screen. Hellraiser – I love the opening with the strings. I have a thing for music that really features a string section because they can be used to impart so many different emotions. These strings start off almost dreamlike, but when the horns kick in with the rest of the orchestra, you know you’re in for something more nightmarish. Dracula – The 1979 version of the classic vampire tale, based on the Broadway production (which really needs a revival with Edward Gorey’s sets intact), was appropriately atmospheric (even with some of the hammy acting), and even with the cop out ending that hoped to set up a sequel, I still enjoy this movie mainly because of John Williams’ terrific score. I love the opening theme and how it segues into the storm at sea. That really is one of my favorite pieces of film music and I can listen to the CD over and over again. Friday the 13th – Very insistent “run for your life” music that gave us the ubiquitous “cha-cha-cha-hah-hah-hah” whisper that you don’t want to hear in the dark. Psycho – This one isn’t really the theme song, but it might as well be. What more can be said of Bernard Herrmann’s stunning score, not just in the shower scene, but throughout the entire film. Who in their right mind would only use strings to compose a film score? Herrmann did … brilliantly … and listen to the use of strings in the Friday the 13th theme to see how influential this is. Screeching violins have become synonymous with a slashing knife blade. Halloween – Of course, we couldn’t end our program without THE theme for the big night. John Carpenter’s simple piano and synth theme is certainly of its era, but it’s timeless as well, and no matter how many times it gets re-orchestrated for the umpteenth sequel, prequel or reboot, Carpenter’s original theme is the one that sends shivers down the spine. Enjoy! 31 Days of Halloween is coming! A week of Young Frankenstein!